We have merged the different segments of Science, Social Science and Humanities to form an integrated whole as Environment and Sustainability transcend all barriers of Subjects and Disciplines. 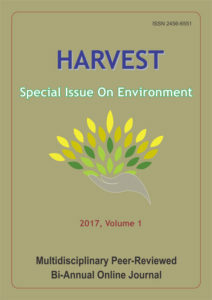 Through surveys and experimentation, reviews and analyses the author-researchers seek a sustainable Planet and a thriving Environment. Let us all then join them in this humble endeavour !